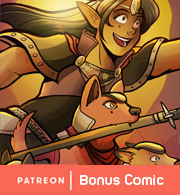 I've started releasing a new short comic called "The Captain's Pack" on my Patreon! It's a short comic originally done for the 1001 Knights Anthology about a girl who finds a pack of werewolf puppies and trains them to be knights. 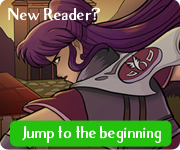 Patrons can read it here or by clicking the link in the sidebar! Once again, big shoutout to Riana Dorsey, who helped me out on the last few pages with her expert coloring work! Be sure to read and support her webcomic Suihira!